Being able to tell nutrition fact from fad is important for anyone, but for people with diabetes it’s crucial. 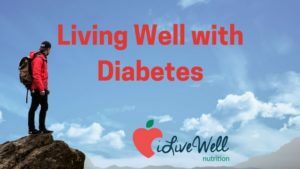 While preparing my notes and handouts for my upcoming Living Well with Diabetes Group, I kept coming back to one thing – the amount of misinformation about nutrition available today. I recently saw a celebrity I’m not going to name say that if everyone would just stop eating bread the country would be healthier. He would never claim that he has any background in nutrition at all, this is just something he heard as an offhand comment and now he’s telling the world. The scary thing here is that he totally believes it and some of his fans are going to believe it too. That’s just one of the ways erroneous nutrition advice gets spread in our culture. Between blogs, books, and ads in your Facebook stream, there’s nutrition info coming to you all the time. Most of it is related to how to lose weight. The part they forget is what it means to be healthy, and that there isn’t a one size fits all plan, especially when someone has a disease to manage, like diabetes. Today I’m going to dispel some myths and get to some facts. There will be a lot of that in my group, but we’ll get started now. Before we do, you might be asking why this is any different than the celebrity giving his opinion above. Here’s why – I’m a Registered and Licensed Dietitian which means I have a bachelor’s degree in nutrition – I’ve studied the science behind what is happening in our bodies as we digest and metabolize food. I’ve completed an internship that focuses on the various areas dietitians work in – clinical, community, and foodservice. I also meet my continuing education requirements to continue to be registered in the US as a dietitian and licensed in the state of Texas so I can stay up on emerging research. The information below is for someone without dietary restrictions due to specific diseases. It is always a good idea to consult a dietitian if you have multiple medical conditions to juggle. And if you have diabetes, it’s important to work with a dietitian to learn how different foods can fit into your day to keep you feeling great. With that out of the way, here are 3 myths I REALLY want to address because I hear them all the time. I hear this from people with diabetes and folks wanting to “eat healthy”. When it’s said, they usually include things like potatoes, white bread, pasta, and bananas. I am so excited to say that you CAN eat these foods! Potatoes are vegetables and bananas are fruit – two very important food groups. And both of these foods have fiber, vitamins, and are great sources of potassium. Potassium is a “nutrient of concern” in the US because most Americans aren’t eating getting enough potassium in their diet. If you have cut these foods out of your life, it may be contributing to a deficiency in your diet! Bread and pasta are part of the “grain” food group. The recommendations are to eat foods from this group multiple times each day, getting about half of our grains as whole grains. Which means half of our grains as refined grains is fine too. This could be a much longer discussion, but for now, just remember – it’s ok to eat bread, pasta, rice, bananas, and potatoes. Portion sizes and timing of these foods is important for those with diabetes. Again – that’s a whole other discussion. For now, just know that these foods aren’t “bad” and they don’t have to be cut completely out of your diet. Other veggies – this catch all group includes all the veggies that don’t fall nicely into the other groups and includes onions, summer squash, cabbage and really just everything else. The recommendations are to eat a variety of vegetables from EACH group each week because they all offer different nutrients. But when I say “eat more vegetables,” that often gets translated into “eat more greens”. That’s one reason why green smoothies have become so popular. But when the focus is on green leafy vegetables, other vegetable groups can get missed. Plus, there’s no reason to think that eating more than the recommended amount of green veggies will provide additional benefits. Eating enough green is important, but we’re not going to get amazing health benefits from going seriously overboard. So when you think about veggies, think variety. Changing up your daily routine so you get some from every group each week is going to give you more vitamins and minerals since each veggie has something different to offer. Now this one just makes me sad. I’ve heard people say this to their newly diagnosed friend. I love to eat good food and I want everyone to be able to eat foods they like. Yes some adjustments will need to be made to your overall diet to control your blood sugar but these adjustments don’t have to include eliminating all of your favorite foods. It might mean changing the timing of your meals or serving sizes. But the important thing to remember here is that you can eat foods you like, and learning to make some small changes to better control your blood sugar is going to make you feel better – now and in the future. Food is meant to nourish your body, and that doesn’t change when you are diagnosed with diabetes. It just becomes much more important! When blood sugar is high or low, people generally do not feel their best. So if you can get that under control, you’re going to feel better. That’s good news in the short term. The great news for the long term is that managing your blood sugar is going to decrease your risk for the complications that can come with diabetes – think kidney disease, blindness, and vascular issues ending in toe, foot or leg amputations! So with that to motivate you, making a few changes can go a long way. My hope for my Living Well with Diabetes Group is that everyone who joins will leave feeling more confident about making food choices, will enjoy their food more than before, and will live healthy MUCH longer! We’ll talk about lots more fads and myths, learn the truth about nutrition and what’s happening in your body, and learn how to make small changes in your daily lives to help you feel better now and in the future.